Your support will help Family Reach heroes like Brendon! The holiday season is in full swing! As you begin your shopping, consider finding ways to give back and help those in need. Our programs and partners make it easy. 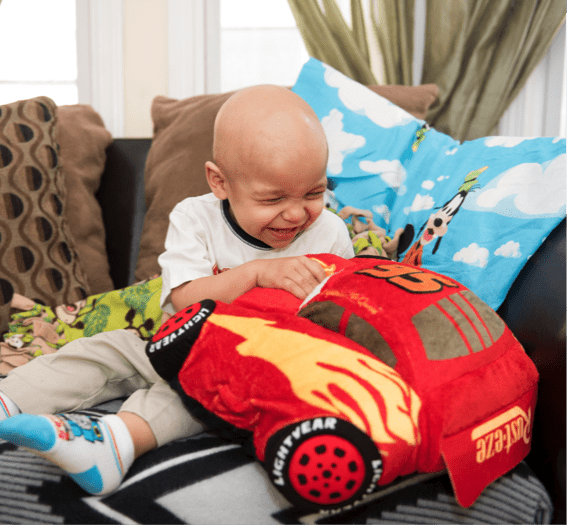 With just one purchase or a few clicks of a button, you can make a difference in the lives of families fighting cancer. Love shopping on Amazon? Love Family Reach? Then make sure to shop AmazonSmile. AmazonSmile allows you to shop the same products at the same prices as Amazon, but a portion of your purchases will go to Family Reach. Click here to link your Amazon account to Family Reach and start shopping! Pillow Pets are plush stuffed animals that come in all shapes and sizes, from pandas and dinosaurs to popular Disney characters. They make it easy to find a unique, personalized gift for the little one in your life. The best part? Choose to round up your total at checkout, and it will go directly to Family Reach! Visit mypillowpets.com. GEEG is a fashion company specializing in designer headwear. Founder and cancer survivor Gina de Givenchy started the business to help boost the confidence of cancer patients struggling with hair loss. Whether it’s a wrap or a scarf, GEEG will leave you looking stylish and chic. GEEG also loves to give back. A portion of every purchase helps support our families! Shop geegny.com today. CMC is a family-owned business specializing in fresh shell eggs and egg products. Their Farmer’s Hen eggs are not only delicious but certified humane, cage free and organic with no antibiotics or hormones. They’re also socially conscious – a portion of proceeds is sent to Family Reach. If you live on the east coast, make these eggs a part of your holiday breakfast! Find a location near you at cmcfood.com/where-to-buy. Known for their comfy, high-quality beanies, Love Your Melon is more than an apparel brand. They’re a team dedicated to changing the landscape of childhood cancer. We’re humbled to call Love Your Melon a Family Reach partner. Their support allows us to reach more families in need. See what they have to offer at loveyourmelon.com. Want to give a gift that keeps on giving? Sign a friend up for their first year as a Family Reach Key Holder. As a member of our monthly giving community, they’ll receive quarterly family stories, updates on their impact and a custom Key Holder keychain. Every time they use this keychain to open their car, home or office door, they are reminded of the role they have in the lives of families fighting cancer. Learn more at familyreach.org/keyholder. During the holiday season, many families fighting cancer are unable to fulfill the wishes and needs of their children. You can change that. Our Hope for the Holidays program let’s you sponsor a family, make a general donation or set up a fundraising page. Your support through this program provides them with presents, food and other holiday essentials. Visit familyreach.org/holidays today. There are so many ways to give back and spread cheer to families who desperately need it this holiday season. By supporting our partners and programs, you’re ensuring families fighting cancer can keep a roof over their heads, put food on the table and maintain safe, reliable access to cancer treatment. Thank you for considering Family Reach this giving season!